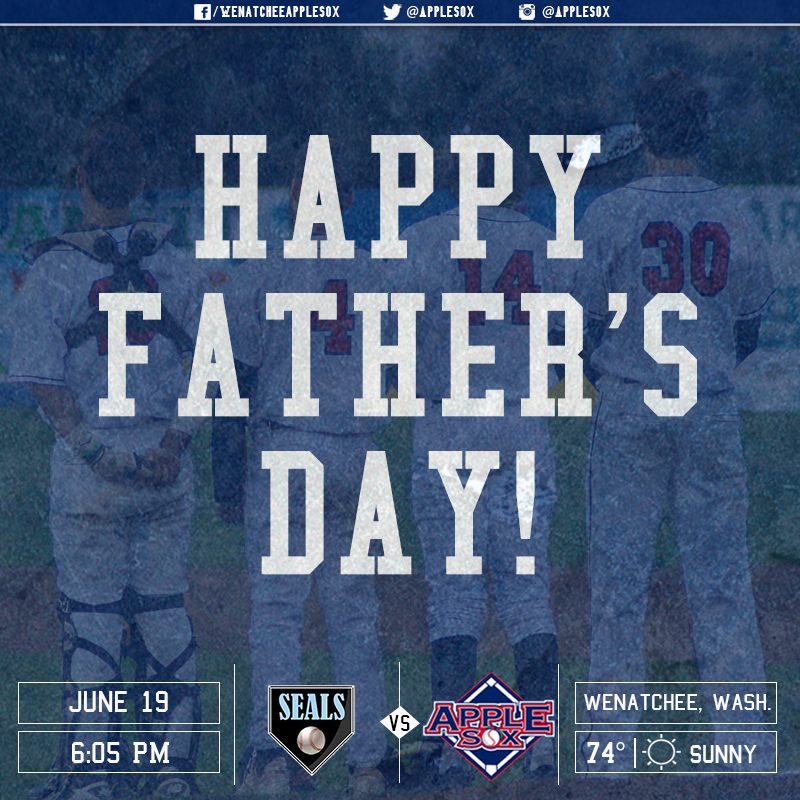 Wenatchee ends a nine-game homestand, Sunday, with a Father's Day matchup against the San Francisco Seals. First pitch is scheduled for 6:05 p.m. The Wenatchee AppleSox (4-8, 2-4 North), fifth place in the division, finish a nine-game homestand, hosting the San Francisco Seals in a three-game non-league set...Wenatchee won its first series of the season, Sunday with a 3-0 shutout of the Corvallis Knights, and won another series, 2-1 over the Walla Walla Sweets, Tuesday-Thursday...the AppleSox are playing their 17th franchise season (12th in the WCL) and are led by second-year skipper, AJ Proszek (32-38) (.457), who is in his 4th season with the Sox...Proszek is assisted by Kyle Hunt and Colton Loomis, both in their first seasons. WENATCHEE – The Wenatchee AppleSox defeated the San Francisco Seals 7-0 in non-league action, Friday night at Paul Thomas Sr. Stadium...Evan Douglas led the AppleSox offensive charge with three hits, including two doubles, and two runs scored..Justin Blatner offered up seven scoreless innings in the victory...he gave up just two hits and struck out six batters...Mac Lardner worked the other two innings in relief, striking out three while preserving the shutout...Wenatchee opened the scoring in the second inning with three runs on an RBI single for Jeremy Ydens and a 2-RBI single for Parker Price...Ryan Kreidler, Jordan Rathbone, and Alex Gonzales each scored, after reaching on singles and a walk, respectively...the AppleSox chased the San Francisco Seals’ starter in the third inning, with two outs...he was charged for two runs on an RBI double for Douglas and a bases-loaded walk of Otis Statum...Evan Douglas scored the sixth run of the game on a wild pitch in the fourth inning, after reaching base on his second double of the game...Price set up the game’s final run with a leadoff triple in the eighth inning...Matt Reitano brought home Price on a sacrifice fly RBI. Friday’s contest with the San Francisco Seals is the first of six non-league contests for the Sox in 2016...Wenatchee will also host the Alaska Goldpanners July 29-31, famous for playing the ‘Midnight Sun Game’ in Fairbanks Alaska...Wenatchee went 3-1 in non-league matchups in 2015...the only loss coming to these very Seals in the second game of the year...Wenatchee holds a 108-40 mark all-time in non-league action, including games played when the team was a PIL franchise from 2000-2004. If you look back to last Saturday’s game with Corvallis, Justin Blatner was the man that got the Sox going for a four-game winning streak...he turned in Wenatchee’s first quality start of the season, following his first spring at Gonzaga...the sophomore is holding opposing hitters to a .238 average. Wenatchee’s left-handed pitching has been a point of strength in 2016...opposing batters are batting just .218 off of lefties, as opposed to a .309 average against right-handed pitching. In their 30th season of summer baseball, the Seals home field is not in the city for which they are named...their diamond is in Alameda...,ore formerly the team was the San Francisco Bay Area Collegiate Baseball Club...now they are merging their brand with the Alameda Merchants...because of split-squad games, multiple doubleheaders and all of the travel, the Seals have 45 players on the roster...outside of the Golden State there are games in Washington, Nevada, Alaska and British Columbia...they are coming from Alameda to Wenatchee and returning right home according to their schedule...the team is a “pay to play” outfit, with each player paying for membership.